Any Podio-esque features with drag and drop relational databases? 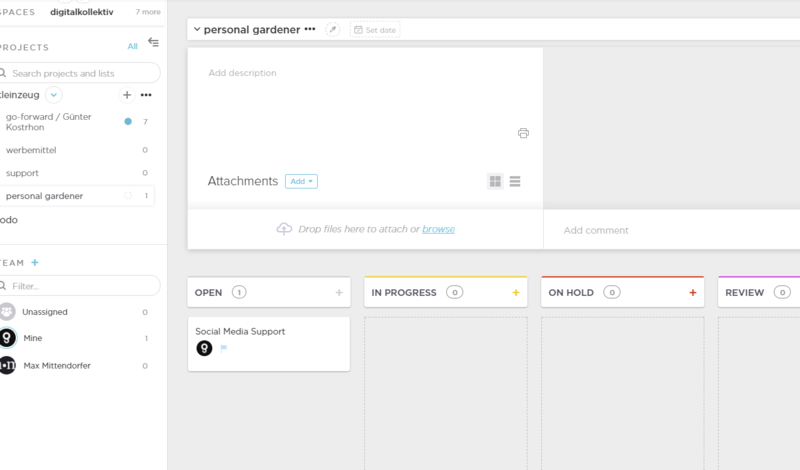 Am keeping a base in Airtable at mo to keep track of everything in ClickUp as just can't keep a track of what is going on at mo (which is a bit bonkers!) - hopefully new release will be spring/summer?!!! You could then run a report on tasks relating to just "pork", or all "meat" which would give you ones marked with Pork, chicken, steak. Hope that's clear and fingers crossed for the implementation!! It would be amazing if we could @-mention team mates inside custom fields! Then we could use them for internal comments by making the custom field private from guests. From support ticket: I'd like the ability to apply a custom field entry for a List, Project or Space. Right now, I can only add entries for tasks. We have different groups of spaces that we want to link together and the best solution we have currently found is to use custom fields but that requires us to go through every task within each space that we want to group together and choose the appropriate dropdown option. With ~200 spaces this can be quite time consuiming. Is there any way to add granular permissions within a list that might hide things like time tracking/accounting from all users outside of HR? I would like to mark Time Estimate or other fields as required. Need ability to make custom fields required and the ability to import and map to custom fields. One thing I suggest, having custom field hidden (like only admin can see it). This is to paste important confidential information like client name, budget and current status of payment. General CSV reports should include custom fields data. Also reports should include task parent names of subtasks. Ability to set a custom field as being required. I would like to have the option to add custom field for a whole project. For example if we make an audit, the note column would be a need for all the project. It is to much time to add a custom field under each of the project for the same purpose. I would like to see some of my custom fields also on Board view. Something like in Trello. Show who last updated a task. It would be awesome to quickly see by whom the task was last updates by. This could be done when hovering over the last updated field in the task. Is calculated custom fields still on the roadmap? Will this include the ability to do simple calculations (e.g. Divide 1 field by another and display result in custom field) similar to what ZenKit offers? @Zeb Will ticket "Bulk Actions with Custom Fields" be considered for v2? The ability to add/modify custom fields with multi select as the adding one by one is a bit gruelling. could you recap all new features present on Custom fields v2 so far planned? @Enzo Di Michele: me too. Is bulk edit of custom fields in V2? @Isham Harris: Hey Isham! We will be adding Custom Fields to List view, as well as permissions for fields with 2.0. @Zeb: Very cool, thank you. Would it be possible to add the ability to select multiple items from a dropdown with the new version of Custom Fields? Sample use case: My podcast episodes usually have 2 sponsors. Currently, I'm just using tags to mark the sponsors, but I'd like to be able to set them using Custom Fields, like I'm currently doing with a Notion database. A project (or list, depending on how it is used) often requires members of the team to have access to data such as the client's phone number, email addresses, passwords, urls, etc. These pieces of information often need to be referred to to throughout a project, so having convenient access to them without leaving the platform. However, not everyone needs to see everything. So being able to assign which member can see what info. @Zeb Hi Zeb, are Custom fields going to still be at the project level or available at the list level? @zeb: This is pretty huge for me. Hate having to create separate projects to keep custom fields organized. I have a furniture list in one list, and a bunch of people to follow up with in another. Because of the way it's currently setup, I have to include order status, shipped date, and expected delivery in both the furniture list AND the follow up list, which starts to get cluttered real fast. @Alexander Wolf: Well it’s coming in ClickUp 2.0! Hopefully 2.0 will answer and solve many of the V1 limitations/idiosyncrasies. I’m working with a small group at the moment and would love to recommend Clickup as our long term solution - this particular change will likely help! Can changes to the value of a custom field - be reported in the task's comments tab/stream like changes to tags, statuses etc. Would be great if currency (or probably number as well) to accept a , as decimal separator as we use it in Europe! I'd love to be able to change custom field values from the Board view, particularly drop-down type fields. 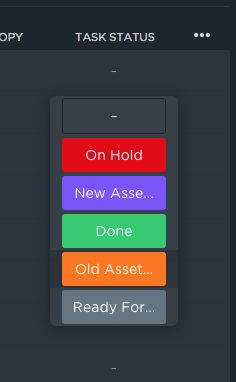 I created a new field for the Type of task (New feature, Improvement, Bug, ToDo, etc), and now I'm updating all my existing tasks with that value. It would be MUCH faster to be able to quickly edit those from the Board view. I noticed in the custom field youtube tutorial, when you added a single number, it showed up in the task list very narrow. I have done the same and the field is very wide, wasting space. How do I control that? @Darryl Brooks: @Zeb my custom field columns are also very wide in list view, I tried making the field names shorter, and making the field values shorter, but nothing helps. How do we control column width? @Bruce Cannon: This is coming with ClickUp 2.0, end of Winter! @Zeb: When you say winter, where do you live? Is that March/April time or do you live somewhere else...? @Gavin Carvell: Yep, we're in San Francisco! I would like to set as required a custom field in a specific project, space. 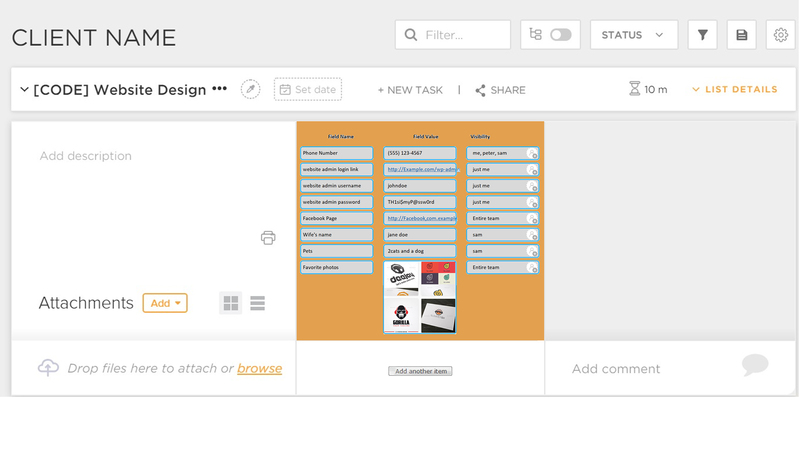 From Customer: Can it be possible to edit custom fields while you are creating a task. Autocomplete for text data in custom fields based on previously added data. Use case: I store people's first and last names in custom fields as an alternative to "assignee" field for people who haven't access to ClickUp to track promises and obligations for personal tasks, not for collaboration. It's like "give a book back to my friend John Doe". In order to be able to filter all tasks related to John Doe. It's possible to do it with tags that have autocomplete and suggestions, but custom field looks more appropriate for this. But it's difficult to type in full names each time. 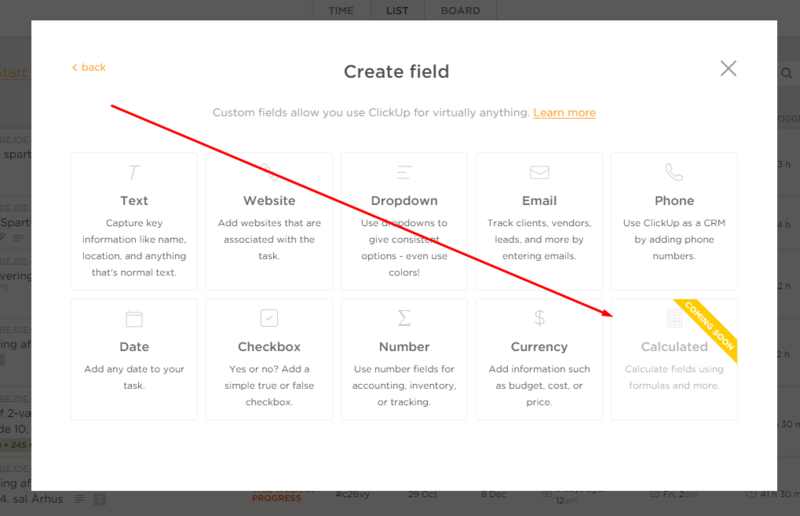 When creating a custom field, can you include if the field is required. If it were required it would restrict a task from being closed if the required field isn't complete? For example, the check box feature or drop down feature. If a check box is required, "Approved" then the ticket can be closed but if it is not checked off then it must remain open until that required box is checked. Hi! Loving ClickUp so far. I'm based in Shanghai, China, and bill most of my clients in Chinese RMB. I noticed there are only 3 options for currency (USD, EUR, and one other). Would it be possible to add more currencies? Absolutely! We'll get that added in the next few releases. @Zeb: Fantastic, thanks so much! [from support] Duplicate Custom Fields. I created a large Dropdown CF and would rather duplicate and rename as I need similar ones. From customer: Needs calculating fields in List view: Say I have client A, B and C with expected fees respectively (that could change when the content of the discussion changes). I need to get the sums of such expectations. Clickup seems have that function on Reporting. I would like to have that in Project view. Just like it shows the time estimate total for all tasks on the side of the list title bar, it should also show a total for all custom fields as well. especially when it comes to price. @John Doe: We're definitely aware of this and will solve it with ClickUp 2.0, later this Winter! From Tomasz Kowalski: What about permissions for the custom fields? Are you planning to add them? It would be great if I can only few team members can set them up. Please provide an option in ellipsis menu for Subtasks: "duplicate custom fields from a specific task"
Right now the workaround is to duplicate the parent task and then convert it to a subtask, that way the custom fields remain the same. (Submitted by user) Have the option to make Custom Fields required so they must be filled out when creating a task. I'd like to calculate a custom field like percentages done. And I like to import data from a xml-value to a custom field. Mostly I use external tools for my writing progress and in this way I like to add the written words to my tasks. But I don't like to update them every time manually. Custom fields on list level. Makes so much sense. In a project you can have several sorts of lists with a different goal, thus seperate custom fields. @Koen Adams: Very important feature to get a useful setting. @Koen Adams: I agree, I would like field at list level that can be summarized with formulas and linked to other list fields. I'll add my vote for this. Currently we use manual / excel-based checklists as forms to collect data (which can then be used to demonstrate compliance with regulatory or voluntary / industry-based standards). Examples include file links, drop-down boxes. For custom fields to be useful for our needs they need to be available as form fields for tasks and checklist items. Wish you could see more of the copy when selecting a dropdown, user not sure what they are actually selecting. Would also be great if you could re-order these also. it is extremely helpful to be able to link two list items (tasks) to each other without making one the dependency of the other. 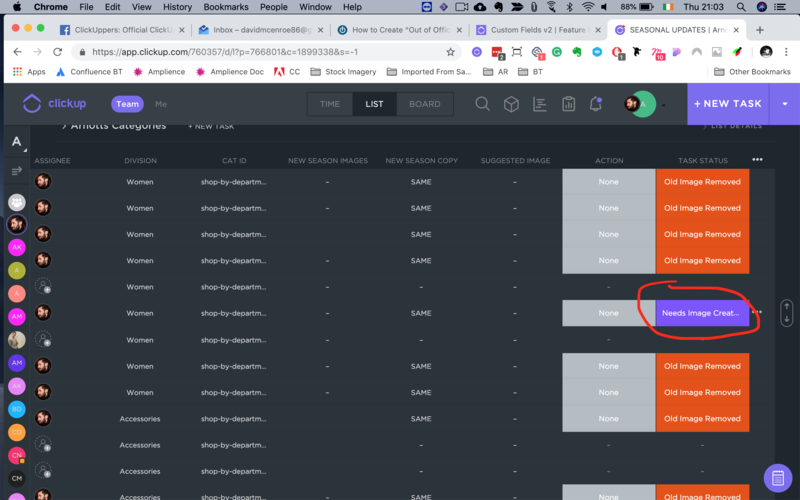 This is an increasingly popular feature in content, contact and task management in which a link from one item is visible in the other, and vice versa. Its called Two Way Reference. For example, this is useful to relate two contacts with each other (I know John from Eve, or Ann is the mother of Jimmy, or this tasks relates to another) and the link can be made visible in the custom task column. The functionality is as follows: When custom field Reference is added, there can be a autocomplete search box that allows to find any task (list item) anywhere, and when selecting one, it will make a link visible in both the current and the target item. A more advanced way of implementing this is the creation of relationships, which means instead of just two way referende links, the relationship is a separate list item which connects two other list items and can hold the information of the relation such as a title, details etc. @Zeb: Since custom fields v2 seems very big, and is not even on the roadmap yet, would you consider in the short term developing just a calculated field? Been watching this thread for a while, because tools for planning which projects should come next is so important. And while the new custom fields are a step toward ranking potential projects, what we need is the ability to calculate a score based on multiple custom field values. So, while many of the Airtable features that @Londya England outlined are super important, the one critical next step for making a lot of processes is calculated/rollup field. @Bruce Cannon: It's not on our roadmap but it will be sooner rather than later. This is extremely critical to ClickUp 2.0 which is planned for early next year. Custom Fields v2 will be done with 2.0. We aren't adding as many things to our roadmap (because the community holds us too tightly when we do), but I can assure you this is planned for the first month or second month of next year. @Zeb: I understand, and I want to give you semi-public props for being so transparent, I'm sure it causes problems. But for what it's worth, it's also one of the the main reasons I'm so committed to sticking with Clickup as it develops. Thanks for the update. And thanks for working on calc fields. And thanks for the various posts in which you or the team has supported the idea of working toward the goal of making Clickup a user-programmable platform like Notion, Coda, Airtable. Right now it's still too rigid for me, but I'm optimistic because of the unique intensity of development on your platform. @Bruce Cannon: That's exactly what we're focused on right now :) We'll release it early next year! Hi guis, thank you for great job until now... i would like to know when you going to add a CALCULATE FIELDS? Of course on all devices. Hey there Daniel! This will be coming with Custom Fields v2! From support ticket: I have about 20 existing projects, and I have a custom field that I have created that I would like to include in all those existing projects. Do I have to go into each one individually to add the custom field, or is there a way to select them all, and add the custom field all at once? @Sophia Kaminski: I'm also interested to know if there is a method to do this also in bulk. Would like to have an column feature in where its shows days until task due date. Would be nice to be able to edit this title! I see there are only USD, EUR and GBP currencies available for currency custom type. Would it be possible to add other currencies? When creating a custom field, please allow us to choose multiple options from the "Dropdown" feature. In V2 it would be great if custom fields were included in the CSV export, also within the reporting export. @Paul Simbeck-Hampson: YES!! I'm surprised more people aren't asking for this - if I'm using custom fields, what good are the exports if they don't include all the data?? @Chad DuPriest: Indeed - all input data should be available as an output, and also accessible and filterable within reporting. @Paul Simbeck-Hampson: Ha! Yes, missing word is year...but let's be optimistic and hope for next week! Upvoting @Ryan Sinfield 's multi-select list request: it's a must have! [Client Submitted via Intercom] I have a suggestion relating to Custom Fields. Having just signed up I started playing with custom fields and I can already see ways to use this keep things simple. However, I have an observation relating to the Dropdown custom field - it would be great if it was possible to change the order of the drop down items once they have been created - especially useful if you need to add a new one. There is no way to 'insert' an new option. @Zachary Martin: Upvoting reordering of dropdown items in custom fields, definitely needed! @David McEnroe: @Paul Woods @Shane Sullaway Hey guys, you can now reorder custom field dropdowns? @Zeb: Fantastic, thanks for the speedy update! @Zeb: I noticed that, really useful, thanks for the quick turnaround! I also noticed you added a tooltip on hover when dropdown copy is too long...that's' great but I'm going to be cheeky and ask that that tooltip hover functionality is added to the active dropdown choices that are too long. Thanks! I would love to have team members as an input in custom field. This way it would be possible go beyond "assign" and "watching" to specifiy individuals roles people play on a project. A field that can be applied to a user based on day rate or hourly rate, with an option to hide the field, ie. only visible by admin's choice. This could then be used to calculate against other custom fields and report on it. An associated criteria would enable manual separation of the logged time on tasks, if not applied by the time tracking, thus the total logged time makes up the split per assignee. Thinking further. Adding the ability to create a custom field at the Project, or Space or List level would allow for a Estimated Budget, an Actual TD and a remaining spend, per person, per space/project/list. Make it so a task cannot be saved until specific fields such as due date and owner have been filled in. I know that calculated fields are coming for numbers and currency fields. However, we also need a custom field of predefined values that can be summed up to use as a way of calculating the task weight / difficulty. If a custom field has been set to show on a card front but no value has been entered (null) then that custom field should be hidden. For custom fields that have been set to show only those that have a selected value should be show. This will avoid situations were valuable space is wasted - see example screenshot. If you want to adjust the order of your dropdown list in ClickUp you have to delete entries to move them. It would be nice to just drag and drop the options to reorder, so the data is not compromised. I would like to be able to set the default choice for a 'dropdown' custom field. Currently when activated each item is set to a dash "-". But would like to be able to set a default so that at creation, each field is set to a particular choice by default. This could be extended to all custom field by allowing a default value. Clickable phone numbers are a speedbump if we don't VOIP call and click a phone #, e.g. to copy it. Please consider making it an optional feature we can disable in our profile. If user adds a custom date field to task, user should be able to see that date in Time view. On the "at list level vs project level" discussion I think that creating a pool of custom fields at or above the project level, but be able to assign them discretely to each list (or at the task level, or choose not to assign any) would be the ultimate. Would be cool to have different custom fields in project. The idea is to assign it per list. Would like to see currency sum of all list items within each "Status" and total within a "Space". Date field options should be similar to selecting Due Date: This Friday, Next Monday, 7 Days, etc. 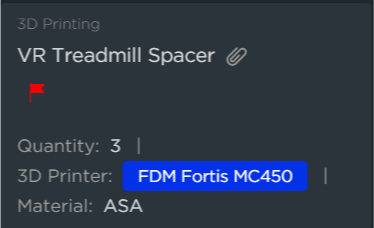 Can we add a custom field that allows selection of multiple from a list? Similar to the way labels work, but these will limited to the project scope only instead of the whole space. In our scenario, our project is divided into 5 constituent components. I have set up a custom field to assign the selected task to a particular component, but sometimes it might be relevant to more than one component so in these cases I'd like to choose multiple options from the list. From support ticket: I'd like to add "Time" to the Date Field for Custom Fields. Also wondering if the date field will have display options such as dd-mmm-yy in future? Custom Text Field: Please add Rich Text as option. @Yuri Corvalan: +1. I would also love the option to display a custom rich text field in its entirety, as opposed to it being truncated automatically at a certain point. Sometimes I want to display lengthier chunks of text in the main view, but this is lacking in almost every productivity app I've tried. @Chelce Hessler: I agree. +1 on full rich text fields! Being able to have a custom field based on a pick list of users, similar to assigned field. The Number and the Currency custom field really should allow the use to comma or dot for decimals. - ability to link lists/tasks within other lists/tasks using custom fields & ability to do "rollup" calculations (I've attached an example of how airtable can link different tables within other tables. In the first picture you can see from the arrows how each table is linked within another table, and comparing the second picture with the first, you can see how "sample"client's total spend is added up in the "client campaigns" tab using the rollup feature. @Londya England: Great. This is must. Allowing custom fields here would give my team some possibilities they are used to from the old system. They are waiting for them to work better togehter. Allow the new extra fields to be searchable from the search box. 2) If a custom field's name is too long to display when the field section is expanded, show full name on hover (or some other way to read it). In further thought, I think we need custom fields per task, to make item 1) above work fully. See also the fields available in Podio for their list templates (they call their lists templates 'apps', and these apps the users can sumbit to other Podio users in a public database of apps. Would be nice to allow that for Clickup users too). I am intending to move from Podio to Clickup because the Clickup interface if much more user friendly. @Yuri Corvalan: Hi, same here. We are considering moving away from Podio since ClickUp has way more features that will help us. I still have to figure out how to "map" clients with projects, meetings, opportunities, etc., but working on it. I'm hoping there's a search option soon that also goes through the custom fields, that would be nice. Regards! With the new custom fields feature it would be helpful to have the possibility to modify the custom fields in bulk mode (similar to edit tag). Cross-reference field 'Related' to link together other items (tasks) in other lists or projects without dependency behavior, but with a title field to explain the reference. This will allow for a link in the list view that lists all 'All tasks having a reference with this task'. In the task itself under everything there can be a listing of such related tasks. A more advance implementation would be to create custom relation types. The custom field would be a search autocomplete field that allows to attach one or more existing items accessible for the team. In the list view custom item column, the first related item would be visible as clickable link which redirect to that item. It could become a dropdown when multiple items were added as reference. Would be good to have some sort of recurring-date field, without the year, to support events like birthdays. E.g. 18th September. Don't get why custom fields currencies are confined to three options only. It could be a editable field in which you type the symbol and name of it. While ClickUp allows for file uploads, I’d like the custom field type option for file uploads. I have tasks that require the same types of files and this would allow me to see which tasks have these fields populated and which do not. I have several custom columns, but they are all very wide. E.g. a checkbox column can be as narrow as possible, but takes up 2 times the space at this moment. Yes please! I had hoped that this would have been made possible with the last release but it was only on the task level unfortunately. Another use of this feature would be that if an image is uploaded a thumbnail of the image will be visible in the custom field column. This is useful for contact lists, user attendency lists, product lists, recepies etc.